each day can help sharpen a child's mind. 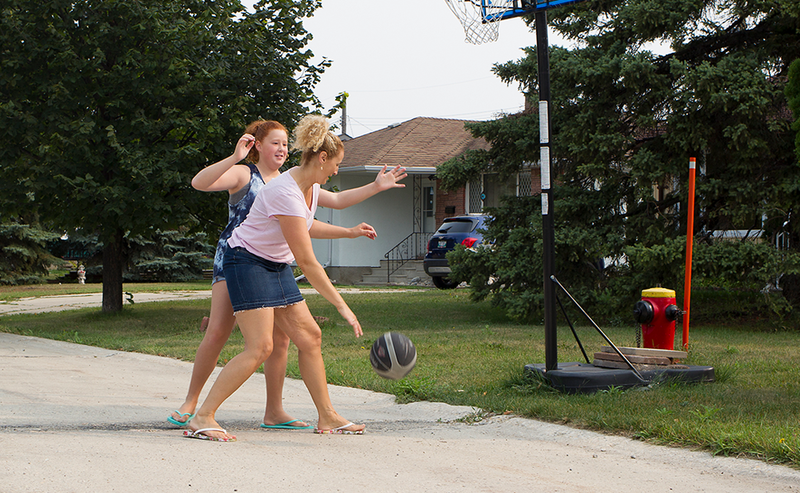 Nealla McKie and her mom, Jocelyn, play a game of one-on-one basketball. Like most 11-year-olds, Nealla McKie likes to hang out with friends - both face-to-face and through social media. She's also pretty active. She attends volleyball summer camp, is an avid swimmer, and often plays softball and basketball when the opportunities present themselves. But while she considers herself to be "a bit of an athlete," even she is not sure if she meets Canada's guidelines for physical activity of at least 60 minutes of moderate to vigorous activity daily. "I'm not sure I reach that every day all that much," she says. Her mom, Jocelyn McKie, agrees. A teacher and former phys-ed instructor, McKie always ensures Nealla and her siblings are involved in organized sport. But she admits that ensuring her children meet the guideline is a challenge, especially during summer holidays when they have more free time. "It's extremely hard for them to get that amount - 60 minutes every day - unless they're involved in organized activity, and my children are, so that helps," says the Winnipeg mom. "But on the days that they aren't, we have to say, 'Let's go outside,' and getting them to do that is a huge challenge these days because of technology," she says referring to the attraction of electronic devices such as smartphones and tablet computers. 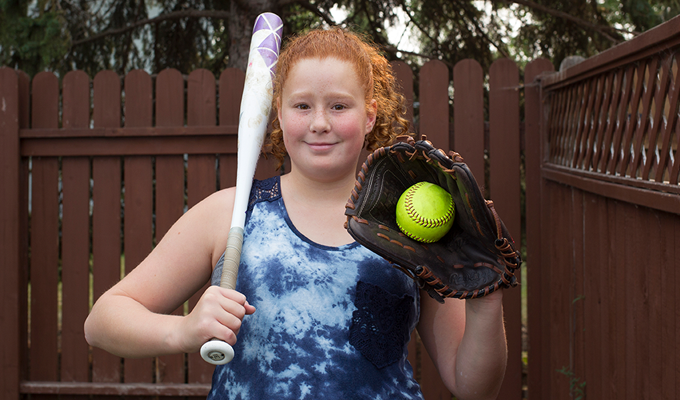 Softball is just one of many sports Nealla McKie plays during the summer. But while Nealla manages to remain active, with a little help from her mom, many kids do not. In fact, the latest ParticipACTION Report Card on Physical Activity for Children and Youth suggests that most kids aren't making the grade. Collectively, the report card gives Canadian children a D+ for overall physical activity - a slight improvement over previous years like 2016 and 2015 when the grade was a D-. Specifically, the report card says only 35 per cent of kids between the ages of five and 17 are reaching the recommended minimum for daily physical activity. For children between the ages of three and four, the numbers are a little more positive - though still concerning - with 62 per cent meeting recommended levels. Health experts have long argued that these numbers will lead to serious physical health issues for children as they get older. But now, they are also becoming increasingly concerned that the lack of activity among kids may also negatively affect the development of their brains. "Collectively, there is reasonably compelling evidence that physical activity is good for the brain, so you can add it to the list of reasons why we really need to pay attention to how much physical activity our kids are getting," says Dr. Mark Tremblay, the chief scientific officer of the ParticipACTION report card. How a Winnipeg school division is using circus arts like juggling and stilt walking to help kids become more physically literate. A bevy of scientific research during the last decade revealed that physical activity helps the brain function more efficiently, and improves memory, focus, concentration, problem-solving skills, executive function and the ability to manage complex issues. It even enhances creativity, says Tremblay, who helped launch the annual ParticipACTION report card in 2005. "So there are all of these benefits, and some studies looking at the mechanisms have shown that parts of the brain light up and are stimulated during physical activity," he adds. But while this year's report card, like its predecessors, shows that kids are not active enough, Tremblay fears the problem could be even worse than experts think. As he explains, the report card is a rather blunt assessment of overall physical activity and well-being among Canada's children and youth. Outside of that 60-minute guideline of moderate to vigorous physical activity, "It's quite likely our total physical activity is declining because our light activities - incidental movement and active play - are increasingly replaced by sedentary screen time," Tremblay notes. "We may see future adults at age 45 getting treatment for ailments that today affect individuals mostly at 65." Indeed, the report did find that many children are spending too much time in front of a screen. Among five- to 17-year-olds, 51 per cent were engaging in more screen time than the maximum of two hours a day recommended by the Canadian 24-Hour Movement Guidelines for recreational screen-based behaviour. For children ages three and four, the number jumped to 76 per cent. The implications of these numbers do not bode well for the health of today's kids down the road because as kids get older, they become even less active. And they are at increased risk of becoming even more sedentary into adulthood. It's difficult to conduct studies that will show conclusively that an inactive child's brain will not develop to its full potential. What has been proven, though, is that the brain does benefit from physical activity. 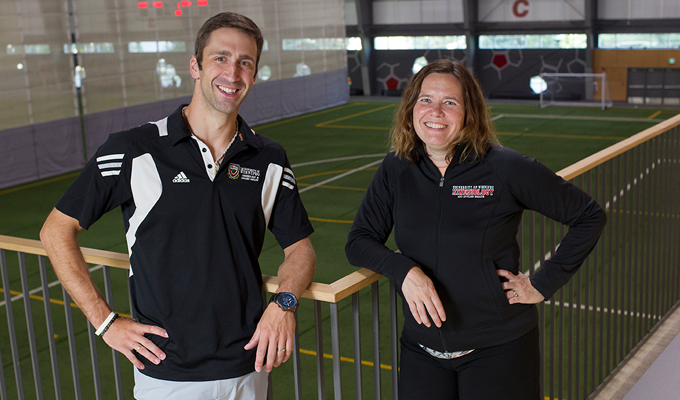 Tremblay points to a study in which students who were physically active before writing an exam performed better than those who did not exercise. "There is evidence of actual brain structure changes where the hippocampus - the part of the brain associated with memory and emotions - gets larger in the presence of physical activity," he says. "The basal ganglia - the communication liaison between the grey matter [neurons] and white matter [connective brain tissues] - also improve in function." For Winnipeg physical education and physical activity researcher Nathan Hall, the evidence that physical activity is a key piece of brain development is unassailable. Hall, who is the Chair of the Physical and Health Education Canada Research Council and an associate professor in the Faculty of Education and the Gupta Faculty of Kinesiology and Applied Health at the University of Winnipeg, recently conducted a literature review of the effects of physical activity on brain development. "One of the main things that we came across and focused on is that getting kids active at a young age has been found to support brain function and development," he says about the report, which he worked on with his colleague at the university, Dr. Melanie Gregg. Partly funded by the City of Winnipeg, their review determined that on its most basic level, physical activity is good for the brain just like it is for any other part of the body because it increases blood flow, which, in turn, boosts the levels of nutrients the brain receives. Canada's guidelines for physical activity say kids need at least 60 minutes of moderate to vigorous activity each and every day. Yet only 35 per cent of kids between the ages of five and 17 do so. In addition, 51 per cent of kids between the ages of five and 17, and 76 per cent of kids between the ages of three and four are engaging in more screen time than is recommended by the Canadian 24-Hour Movement Guidelines for recreational screen-based sedentary behaviours. "It's almost like you're giving your brain a workout," Hall says. He points to a study involving mice, which showed that those able to run on a wheel grew more neurons in their hippocampus. While physical activity is important for brain health at any age, Gregg and Hall paid special attention to early childhood development, at the behest of the City of Winnipeg. "The City of Winnipeg wants to develop a physical literacy program to help early childhood caregivers - parents or workers at daycare centres," Hall says. "One of the benefits they were interested in promoting was the healthy body, healthy mind idea: Does getting kids physically active at an early age influence brain development?" The program - which will soon be rolled out as a pilot project - offers a booklet with guidelines for physical activity, and milestones for infants and toddlers. Hall, Gregg and the City of Winnipeg have also received funding from the Social Sciences and Humanities Research Council of Canada to study the impact of the program on children. Hall believes the program should be beneficial because physical literacy - the acquired learning necessary to be physically active for life - often gets overlooked in early development. "Parents really do care about meeting physical milestones up until a point," he notes. Parents will ensure their infants get plenty of tummy time to help strengthen a child's neck muscles to hold up their head, or encourage crawling infants to take their first steps. But when a child turns two years of age, "All of a sudden the focus on physical development is reduced tenfold because we then really focus on doing things such as counting and learning the alphabet," Hall says. Staff at early education settings in particular spend a lot of time on intellectual development, while leaving parents to teach physical skills like learning to swim, riding a bicycle and skating. But the process of acquiring those skills often does not begin for a long time after children can walk, he adds. "So it can take four years before we start thinking there are other physical skills we'd like children to learn." Manitoba Fitness Council Executive Director Stephanie Jeffrey says being physically active can enhance a child's capacity to concentrate. What's more is that early physical literacy adds up to long-term benefits. While children five years of age and under are naturally physically active, an additional emphasis on physical literacy - instilling some basic movement skills earlier - sets them up for long-term success physically, academically and socially, Hall says. "One form of literacy essentially affects another form of literacy." He points to Timbits hockey and soccer programs for young children, in which it is not just learning the physical actions involved in playing these sports that are beneficial. It's the socializing and cognitive skills they pick up as well. "Even in things like catching and throwing a ball, there is cognition that is occurring there, every moment when they're learning those skills." 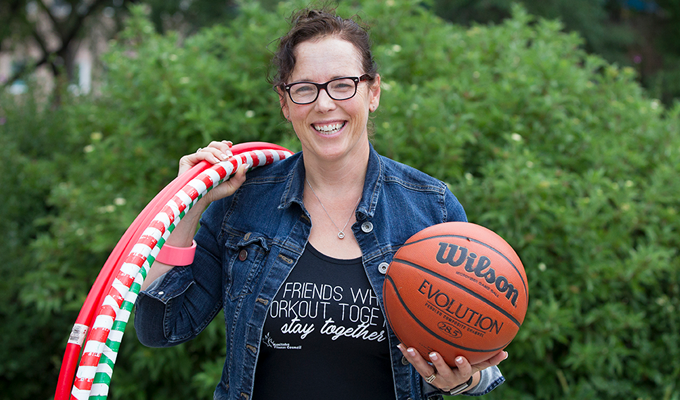 Stephanie Jeffrey, Executive Director of the Manitoba Fitness Council, says her organization has long been singing the praises of physical activity's potential to help children with intellectual capabilities like an improved capacity for concentration. "But what we couldn't prove was that there was a direct correlation between brain development and physical activity levels," says Jeffrey, whose organization trains people to be community leaders in physical fitness and activity. What's also interesting, says Jeffrey, is the breadth of benefits from physical activity. "We had not related (physical activity) to creating the ability in children and youth to be able to develop their own coping strategies, stress management, self-worth, emotional regulation and self-control," she says, referring to findings in the ParticipACTION report. "We've got more and more child depression and anxiety, and it's a sign of dysfunction between the body and the brain." There are no studies that show that a lack of physical literacy will necessarily deprive kids of the skills they need to be active and, in turn, enhance their brain development. But what is certain, says Tremblay, is that the rates of mental health problems among children, particularly adolescents, are on the rise. "We've got more and more child depression and anxiety, and it's a sign of dysfunction between the body and the brain," says Tremblay. "We're misusing the body, and this is creating neurological issues that are likely to continue and accelerate." Think of today's children as the guinea pigs in a massive, unorganized social experiment. They are the first generation to grow up in a world of constant interaction with electronic devices, and the effects of this are largely unknown. But based on research so far, scientists like Tremblay are not foreseeing positive outcomes. Already, diseases once associated with older adults - Type 2 diabetes, high cholesterol, high blood pressure and cardiovascular disease - are affecting younger populations because they are less physically fit than earlier generations. "We may see future adults at age 45 getting treatment for ailments that today affect individuals mostly at 65," Tremblay says, in reference to diseases like dementia and osteoporosis. The lack of activity among kids is exacerbated by changes in parenting during the last few decades. "There's an evolution of the notion that you have to be hovering over your kids all the time to be a good parent. But from a movement perspective, evidence suggests it's almost the opposite," Tremblay says. "Kids move less in the presence of their parents." And more opportunities for physical activity - from sports programs to infrastructure like parks, playgrounds and skating rinks - seem to make no difference. In fact, when comparing physical activity report cards across many different countries, children in Canada are less physically active than those in developing parts of the world like sub-Saharan Africa, an area marked by very low standards of living relative to North America. "The difference is freedom," Tremblay says. "Those kids (from developing countries) are like my generation when growing up." He notes that just a few decades ago, children spent more time outside playing on their own. They climbed trees, got into tussles in the park, rode their bikes for hours on end, and largely were left to determine their own adventures. "When I was a kid - I'm 57 - the ultimate penalty when you were in trouble was you got grounded, which meant you had to stay inside, and that was like torture." Consider that today the ultimate punishment is being banned from screen time and told to go outside and play, he adds. Nathan Hall and Melanie Gregg have studied the effects of physical activity on brain development. "To me, it's a very profound statement about how we've changed," he says. "And it's not a big plastic, rubberized playground, in my view, that will solve the problems. In fact, it's the opposite. Let kids go into the bushes and trees in the park, and play and climb." Certainly Nealla McKie's mom, Jocelyn, agrees with this observation. "We're largely fortunate because we are home to help facilitate more activity with our kids," says McKie. "But kids aren't just getting on their bikes anymore and going on adventures like we used to." This is concerning, she says, because children today are missing out on necessary skills like problem-solving and risk-taking that they used to acquire while playing outside on their own. To counter the problem, McKie believes innovative physical education programming is required - like the Circus Arts Education Initiative her daughter participated in during her Grade 5 school year at Ecole Robert Browning in the St. James-Assiniboia School Division. The program, conceived by University of Manitoba researcher Dean Kriellaars, aims to boost physical literacy among children at ages nine, 10 and 11, after which physical activity levels drop. And learning to juggle, walk on stilts, and swing from a trapeze have much in common with activities children would engage in while playing at the park. Yet the biggest benefit McKie saw in her daughter was psychological. "Nealla said there were things she could do that others couldn't and that made her feel good about herself." Additionally McKie says the program boosted her daughter's confidence. She would try very challenging new skills - juggling and stilts, for example - and with practice would eventually be able to do them. As an educator, McKie recognizes that this kind of self-directed problem-solving is the ideal way to learn. Still, circus arts programs aside, there is no replacement for the pure, self-directed physical activity that children can engage in when left to their own devices, she argues. "We're bubble-wrapping our kids to the point where they're not getting a chance to figure things out on their own terms," McKie says. "So yes, I want my kids to be active so their bodies feel better, but I also recognize that their minds do better, too." Joel Schlesinger is a Winnipeg writer. Students who exercise before a test show stronger brain function than those who don't exercise before a test. So, next time students feel the pressure to cram, encourage them to take an active break from studying; some heart-pumping physical activity may actually be the smarter study technique. When the body doesn't move enough, the brain can't perform to its fullest potential. Children with poor aerobic fitness appear to have more difficulty solving problems and are more likely to make mistakes when trying to sort out a challenge. Sections of the brain dedicated to memory and learning (hippocampus and basal ganglia) are larger in active children in comparison to their less-active peers. Being physically active can boost memory in children and youth, including children with brain-based disabilities (e.g., attention deficit hyperactivity disorder, autism spectrum disorder, cerebral palsy). Active kids are better equipped to get creative. Even if they aren't artistic, creativity can manifest in think-on-your-feet scenarios such as strategizing for a game, leading a team project, or solving a math problem. Without adequate physical activity, it's difficult for kids to tap into their full potential. Kids who participate in physical activity have more focus and longer attention spans, compared to their less- active peers. This correlation appears to be consistent for all children and youth, including those with attention deficit hyperactivity disorder and autism spectrum disorder. Just like adults who love that "runner's high" from going the distance, kids who are active experience the same rush of feel-good brain chemicals (serotonin and dopamine). Children and youth who are fit benefit from this rush of chemicals and experience fewer depression-related symptoms than those who are not fit. Kids with brain-based disabilities are at an increased risk for mental health problems, so they have even more to gain from getting, and staying, active. Evidence suggests that physical activity may help lower feelings of anxiety in children and youth. Dance and team sports may be especially effective in children and youth with brain-based disabilities. Canadian kids are on the right track here, with 77 per cent of five- to 19-year-olds and 46 per cent of three- to four-year-olds participating in organized physical activities or sport.